Indiana University East has a new virtual reality laboratory. The Virtual Reality (VR) Lab is located in Hayes Hall Room 024. Todd Duke, executive director of Information Technology at IU East, said the VR Lab is now open and ready for use. IU East students Josh Powell, a sophomore informatics major, (front right) and Johnny Fike, a freshman criminology major, use the new VR Lab. Duke said the VR Lab made possible through a strong partnership with the IU Advanced Visualization Lab (AVL). The group previously assisted the campus with an IQ-Wall, he said. The IQ-Wall, located in the First Bank Richmond Tech Zone in Whitewater Hall, was the first one of its kind installed at an IU regional campus in November 2017. The VR Lab includes 10 stations complete with high-speed computers capable of supporting the software and HTC Vive VR headsets, including 3D sound and hand panels. Duke said the overall completion time to set up the lab took less than a year, including working out the location and obtaining the hardware. “Once we had the logistics worked out the actual setup time was less than 30 days,” Duke said. The VR Lab is available for use by students, faculty and staff. The lab benefits all academic disciplines. While the lab has been under development for the past year, the use of virtual reality on campus has been around much longer. IU East Chancellor Kathy Cruz-Uribe uses the new VR Lab under the direction of Josh Powell, a sophomore informatics major. Tim Scales, senior lecturer in the School of Business and Economics, has been incorporating virtual reality into his curriculum for four years. He started with an Oculus Rift before adding a 3D printer and Carvy wood carving machine. The equipment was provided with grants through AVL at IUPUI. 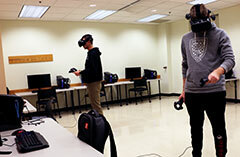 IU East students Josh Powell and Johnny Fike had some experience with virtual reality in high school. Powell a sophomore informatics major from Fortville, Indiana, and Fike, a freshman criminal justice major from Bradford, Ohio, have found opportunities to expand on their knowledge of the technology and to enhance their experience on campus. Powell is a student worker with IT. This year he has worked directly with Scales to demonstrate VR to students, faculty, staff and community groups or schools visiting campus. This this summer, he spent time actively recruiting individuals to tryout the VR in Whitewater Hall at the IQ-Wall. Now, he looks forward to assisting the campus and community in the VR Lab. He said VR helps students to find new concepts and provides a new format for students who are visual learners. “Virtual reality adds an element of getting people together to do something of interest that is fun and it gets people involved on campus,” Powell said. Powell, who attended IU East as the first men’s soccer recruit, has watched classmates use VR in many different ways. For example, his teammate, Joao Vitor de Lima, a freshman from Curitiba, Brazil, used VR to show classmates his home on Google Maps. Fike was introduced to Scales and his use of VR just before the first week of the fall semester when he attended Extreme Summer JUMPSTART, a five-day college prep for all first-year students. Fike is a member of the men’s cross country and track and field teams. When not involved in athletics, class or the pep band, he can be found working with others to learn how to use the VR environment. Scales, Powell and Fike work with various age groups to experiment with and learn from VR. This September, they facilitated a learning station with third graders from Randolph County who visited IU East for the kickoff to the Randolph County Promise. On November 30, they worked with freshman and sophomores from Richmond High School and provided one of the first group tours of the VR Lab. They hope to encourage more faculty to take advantage of the new VR Lab. 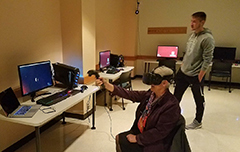 Shelly Burns, clinical assistant professor in the School of Nursing and Health Services, is one of the faculty members looking for options to use the VR Lab. “Right now, we’re working with the Office of Information Technology to look for software that will allow nursing students to practice crucial, fundamental skills like catheterization or IV insertions,” Burns said. The school also has a VR program with patients. Nursing students talk with the patients, which respond through a voice recognition program, to access medical needs and care. Burns said VR programs allow students to practice and master skills in the lab before they get into the real world. Duke said the use of virtual reality enables students and faculty to visit locations they otherwise could not visit due to funding issues, distance, or historical sites that may no longer exist. It provides the opportunity to work in a non-threatening, non-dangerous environment, and provides access “virtually” to equipment that may be unrealistic for a campus of IU East’s size to own or have access to, he said. Scales said while he finds VR is an asset to instruction, he has also seen it inspire others to want to implement the technology and the opportunities it can offer. “Through VR we are truly engaging students and engaging them in their education. It’s up to us as educators to find ways to use it,” Scales said. Burns agreed that it will be students who drive the use of VR.“This generation is super excited about the VR programs. They’re tech savvy and more apt to want to learn from it,” Burns said.